Planked Steak and Oysters. Have an extra sirloin neatly trimmed; put it on the broiler; broil five minutes on one side; turn and broil five minutes on the other side. Make the planking board very hot while the steak is broiling. Put the steak on, garnish the board quickly with mashed potatoes and put it under the broiler. Turn the steak once. Dust it with salt and pepper and rub it with butter. Cover the top with broiled oysters, then run it again under the broiler for a few minutes. [illegible] hot. 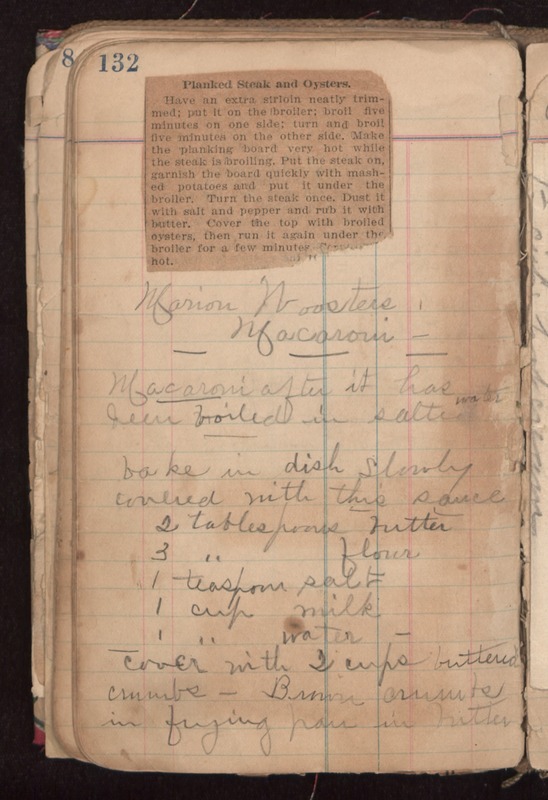 Marion Woosters Macaroni Macaroni after it has been boiled in salt water bake in dish slowly covered with this sauce 2 tablespoons butter 3 " flour 1 teaspoon salt 1 cup milk 1 " water cover with 2 cups buttered crumbs - Brown crumbs in frying pan in butter.